Photos taken with an iPhone typically end up in one of three places – stored on the iPhone until they’re deleted or the phone is replaced, uploaded to and kept on an image hosting website like Flickr or stored on a social networking site like Facebook. Each has its own advantages. Keeping the photos on the iPhone is another way in which the iPhone is a multi-tasker. People used to carry snapshots in their wallet or purse so they could show to family and friends pictures of their boyfriend/girlfriend, children/grandchildren or other people and places that were important to them. Carrying the actual printed photos quickly became a bulk problem. With the iPhone people can now carry hundreds of pictures limited only by the amount of memory available on the phone and can really bore their friends and family. It can even be used as a replacement for Uncle Harry’s 35mm slide show of his latest vacation. Kidding aside, the iPhone is a very convenient way to carry the images that are important to us. If you want to upload the photos to your computer or to a website like Flickr or Facebook you will need an app for your iPhone. For this article I spent a few hours online researching bulletin boards, review sites and blogs trying to find the best apps for each of the upload options. The results were kind of scary because of all the difficulty people seemed to be having with various apps. So, I started testing them myself. For all the Apple devotees out there, I’ve been using a PC since the early 1980s so my comments will refer to a Windows system. It seemed that at one point people were experiencing a lot of difficulty trying to upload saved photos from their iPhone to their Windows computer. However, there is a very simple way to do this that if you follow these steps it will save you a lot of frustration. When you connect your iPhone to the computer, even if iTunes automatically opens, a Windows system dialog box pops up asking you what you want to do with the device you just connected to the computer. On my computer the first choice is to treat it as a camera. Highlight that choice, click OK and follow the steps indicated. It’s fast and easy. Once the images are on your computer it’s like any other photo from any other source. You can upload it to Flickr, Facebook or any other site. You can also manipulate the photo in the same manner as all your other photos. There was a lot of chatter about what app to use to upload photos to Flickr including a number of negative comments regarding the Flickr app. I have to assume that either all the bugs have been corrected or a lot of the negative comments were from those special people that just like to post complaints online. 1. Log on to your Flickr account through your iPhone. 2. Touch the camera icon in the upper right corner of the screen. 3. Touch the ‘Upload from Library” bar. 4. Touch the photo(s) you want to upload. 5. Touch the “Next” bar in the upper right corner. 6. Add a title, a description, add the photo to a set or add a tag to the photo. You can also set the resolution – either full resolution or medium format. 7. Touch the green “Upload” bar on the bottom right corner of the screen. 8. You’re finished. The photo has been uploaded. It really is that simple and it’s quick. Best of all, the app is free. Facebook is even easier than Flickr. Make sure you have the latest Facebook app on your iPhone. 1. Log on to your Facebook account. 4. Touch the camera icon in the upper right corner of the screen. 5. Touch the “Choose From Library” bar at the bottom of the screen. 6. Touch the album you want to upload the photo from (When you take a photo with your iPhone it automatically goes into a folder named “Camera Roll”). 8. Press the “Upload” bar in the lower right corner and the photo uploads to your Facebook account. That’s all there is to it. Like the Flickr app, the Facebook app is free. One of the comments/complaints I read about frequently while searching various bulletin boards and blogs was that the person making the post couldn’t upload photos to Flickr from the camera roll. They could only upload immediately upon taking the shot. I haven’t had that problem so as I mentioned before, either the problem has been resolved or it was an error on the part of the user. 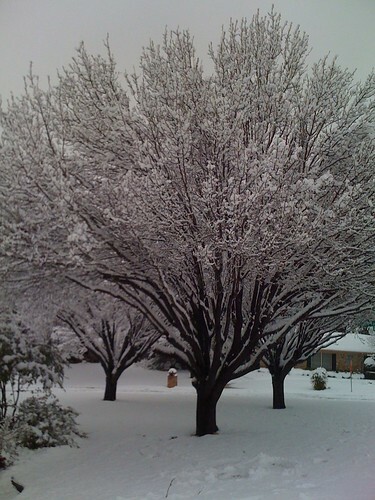 This photo was taken by my daughter during a recent snow storm in Ft. Worth, TX using her iPhone. She sent it to my iPhone by text message and I uploaded it to Flickr from my iPhone. I then “grabbed” it from Flickr for this article. 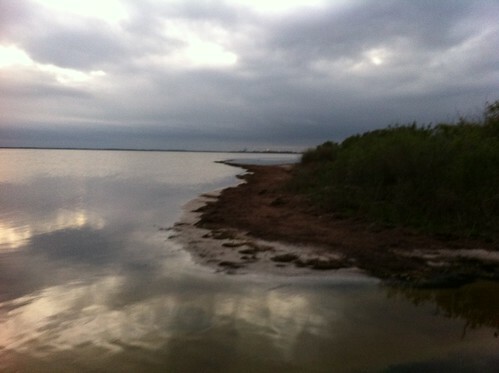 I took this photo with my iPhone on Merritt Island, FL looking across to the launch pads at the Kennedy Space Center. I was taking photos with my DSLR on a tripod and captured this one by holding my iPhone above my DSLR. Following the steps above, I uploaded it to my Flickr account. Both of these photos illustrate some of the limitations of the iPhone. While the iPhone captured the image of the snow storm and allowed my daughter to send me proof of the weather they were experiencing, the camera function of the phone, as do most if not all cameras, exposed for 18% gray causing the snow to look dingy. With a DSLR the photographer can compensate for that and make the snow appear white in the image. The second image was also outside the ability of the iPhone to render an acceptable image. The image below was taken with my DSLR at approximately the same time as I took the same image with my iPhone. 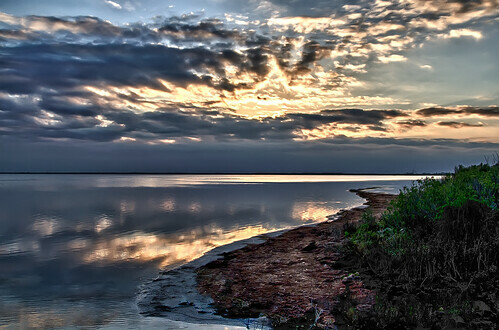 However, with my DSLR I captured three bracketed exposures and converted them to an HDR image. If you know the limitations of the iPhone and you use the iPhone in situations where it’s designed to be used, you can still capture good images and easily upload them to your Flickr or Facebook account. In the next article, I’ll talk about some apps for editing the photos you’ve taken with your iPhone.